Search as they might, I am internal sound—at least in the nether regions--No polyps or other worrisome findings. I recovered quickly—and entertained myself. I worked first on bring my blood oxygen level to 100—it was fine at 95 to 97--but hey, why not get it to 100? Slow controlled breathing, and soon it was at 100 and staying there. That slowed my pulse a bit, and my next attempt at self entertainment was to slow my pulse. I have a slow resting pulse--(55 or so) and deep breath relaxation brought it to 51/52. But I went meditative and worked on slowing it down even more. Trouble was, once I got it below 50, the alarms went off, and they distracted me enough that I couldn't sustain the low level--47 was consistently achievable, but 45 took a real effort –at being relaxed—(a bit of an oxymoron!) At one point the nurse came over to check on me (the repeated short alarms tones caught her interest) and I told her I was having fun, trying to slow my pulse. She looked skeptical.. So I did it again. She wasn't happy with my behavior. Well what was I suppose to do? I bore easily. I need to keep my mind engaged, and with out knitting or anything to read, and being forced to sit back and relax, well I went to town, and relaxed—aggressively! It was something to do. A friend of mine is positively jealous of my slow pulse, and low blood pressure--(remember how I said, I am generally in good health?) --All the exercise in the world, and he can't control his BP—and has a faster resting pulse. Getting back to the little knitting I did--Here is a bottom view of the socks. See the lovely birds eye pattern?, See the center sole gusset? See how few R's were knit after the gusset? But it's OK—the sole is about 5 inches now—another 2 inches or so, and it's time for the toe, and then these socks will be done! My gauge has change slightly—the foot of sock is less stretch than the leg --where, I have learned, the hard way-- to work extra hard at keeping the knitting loose. 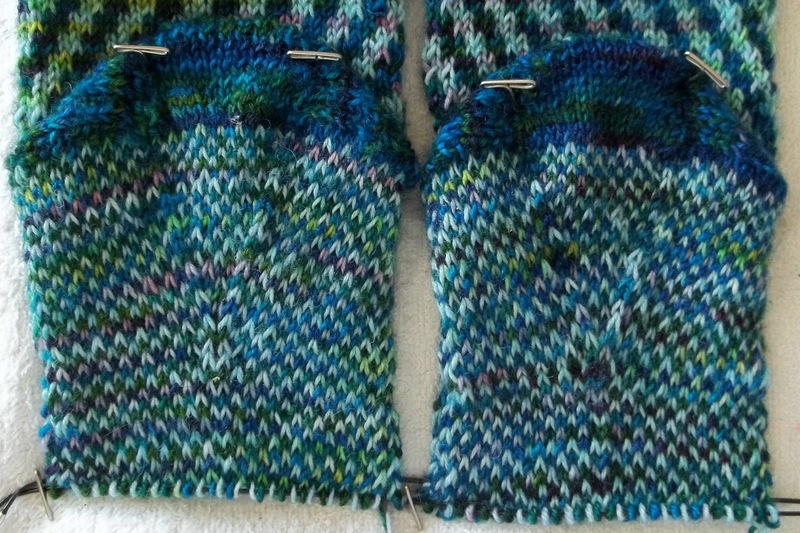 I work diligently to keep the floats loose, and the knitting stretchy when I start--but not so much in the foot area. It's not so tight as to be a problem—Just enough that I notice it. But the loose leg work means the sock easily pulls over my heel—and I can make the knit the foot portion of the sock an extra round or two longer, to make sure the negative ease in width is balanced by some positive ease in length. I didn't get anything done on the shawl, and this AM I am off to get some sewing notions—and then, likely, this afternoon, to sew. I have some vague plans for Saturday, if they pan out, I won't have much time for sewing -even though, Saturday is supposed to be for sewing. Sunday is open, though. My daughter and I have long made it a habit to celebrate mothers day when we want—and that is rarely on the official Sunday—but her M-I-L to be is coming to queens, so I might spend a few hours with them both—Since I am not sure if Sunday knitting is on at Panera's. Besides, it stays bright so late, I likely will have time to do both—visit with my DD, her fiancé, and his mother as well as spend some time knitting.